It may sound strange, but Sony and others — which perhaps include Apple — stand to win from Samsung’s efforts to promote its new Galaxy Gear smartwatch. Samsung’s first TV ad spots were published this Sunday and, since the Gear sits within a relatively new category of device, they focused heavily on the concept behind smartwatches, with little mention of the product itself — that’s represents a pre-launch platform for future rivals. The two one-minute videos are compilations of sci-fi programs and cartoons which have featured smartwatches in some form. The overall message from the ad spots is clear: the future is here, and it is Samsung that is bringing it to you. The irony of Samsung’s Gear ads — which ex-TNW editor Matthew Panzarino points out they bear striking similarity to Apple’s first iPhone ad — are that the company is actually warming the oven for others by giving the concept of consumer smartwatches their biggest marketing push ever. Pebble was very much a startup effort — with its funding coming from Kickstarter — while past efforts from Sony and countless others have largely gone under the radar of mainstream consumers. Samsung has shown a propensity for spending large amounts on advertising in the past — the company is said to have out-spent Apple on marketing in the US last year and this past weekend it bought up 10 consecutive pages of ads in the New York Times — so it seems likely that the Korea-based company has set aside significant sums in an effort to create demand for this new kind of consumer technology. Tech-savvy folks may appreciate it, but Samsung’s real challenge is to make that connection within ‘ordinary’ non-techie people, so we can likely expect more ads that sell the concept more aggressively than the device itself. That’s going to be interesting if Apple — or others — release a more complete smartwatch that overshadows the Galaxy Gear. The problem for Samsung isn’t that it is an early-mover — look at how the iPad enjoys a high level of brand recognition within the tablet market, for example — but whether its product is considered by consumers to be best in class. 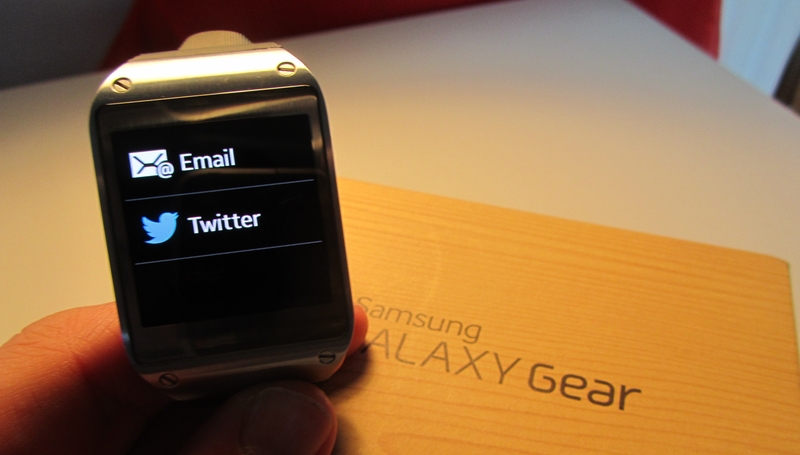 It’s too early to assess that with the Gear, but certainly it has weaknesses that rival smartwatches could exploit. At $299, it is no cheap timepiece, and yet it depends on being paired with a smartphone to carry out almost all of its functionality. That’s not exactly ‘smart’, although our own Ben Woods was still reluctant to part with it when he reviewed it. Now we must wait to see what Apple (seemingly) has under its hat, and whether others can step up to take the concept of the smartwatch to the next level — but the consumer offensive for smartwatches is already underway.